The bathroom is one of our favorite places in the home to relax. 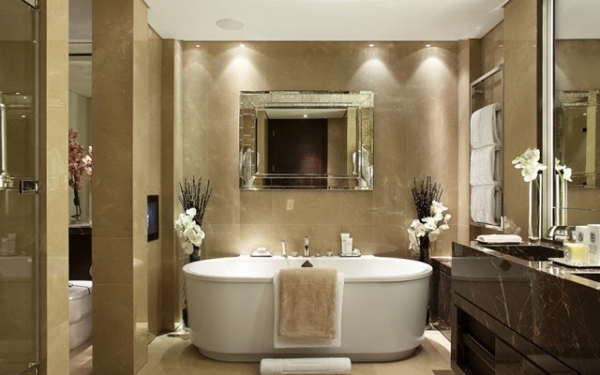 There is nothing like coming home to a long bath in a well-done luxurious bathroom. 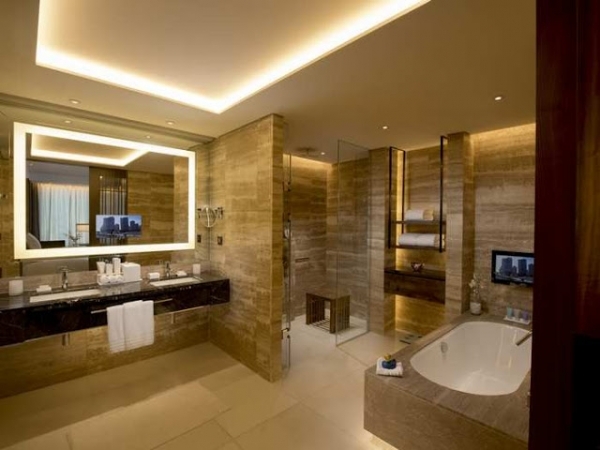 So, today, we’re going to share with you some amazing bathrooms. 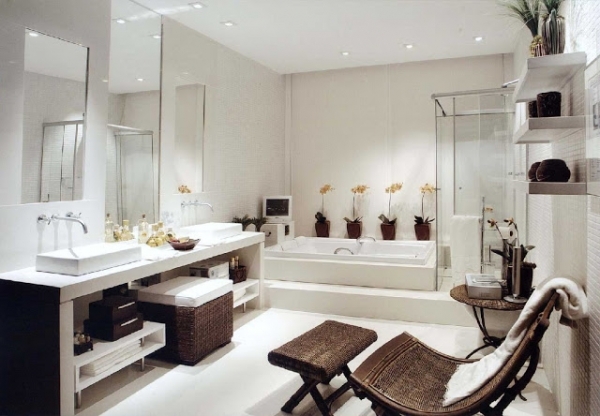 Neutral calming colors fill this spacious bathroom, creating a serene and sleek atmosphere. The star of this bathroom is the shower and bathtub, with its ornate detail and bright blue color. Marble floors fill the room, adding a luxurious feel. 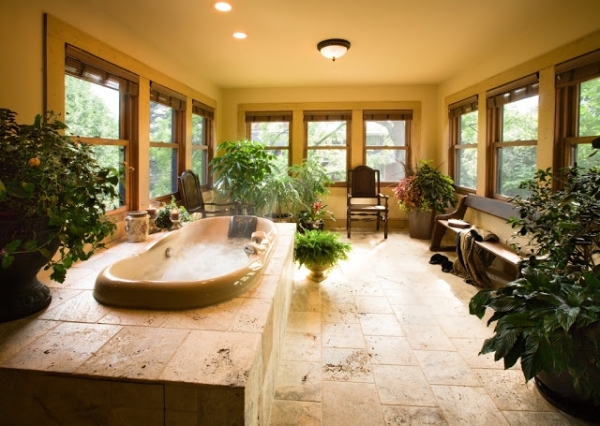 Numerous windows and plants provide an outside-like experience in this fantastic bathroom. 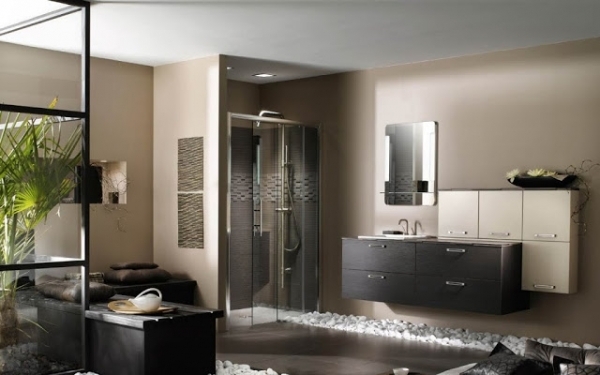 We love this modern bathroom with its brown, black, and white. Clean lines, an adorable bench, and detailed wallpaper, complete this gorgeous space. The teal and chocolate brown provides an absolutely stunning combination in this space. 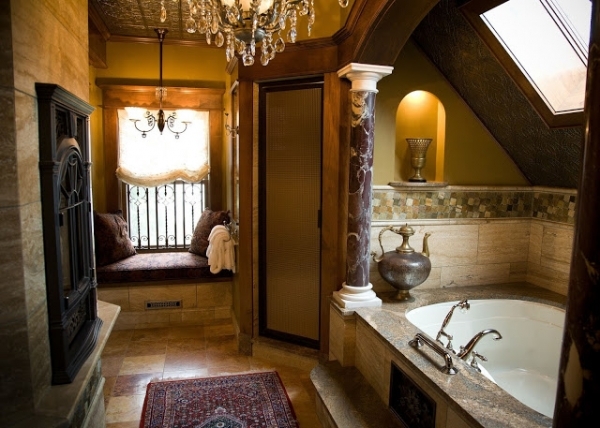 This bathroom has a bit of old world charm. The chandelier, window seat, and marble pillars, are fabulous design touches. 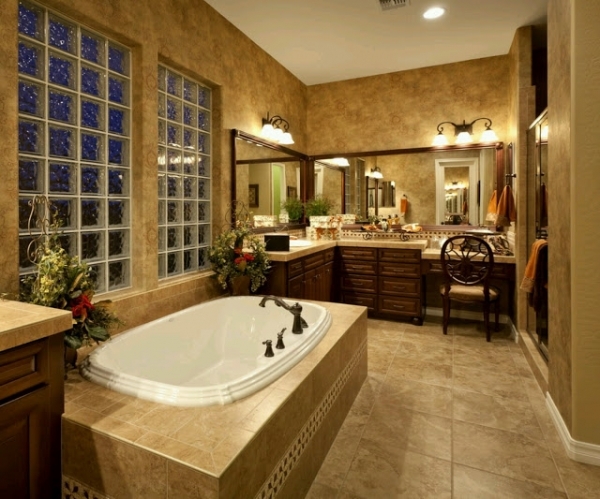 Natural colors and mood lighting create a relaxing and alluring atmosphere in this lovely bathroom. Absolutely stunning. 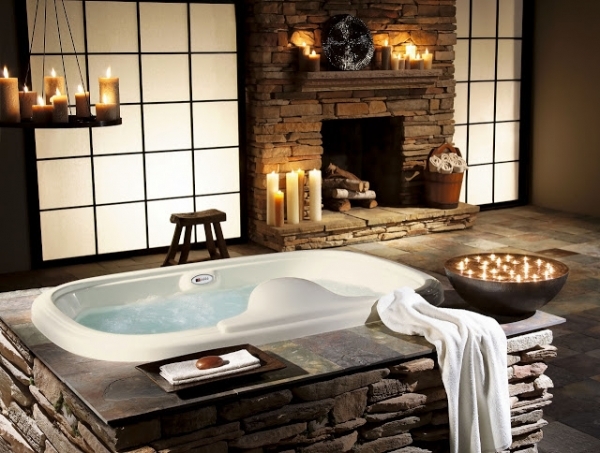 This one is definitely on the top of our list of amazing bathrooms. A multitude of candles, rocks, a fireplace, and gorgeous flooring, create a unique and enchanting space. 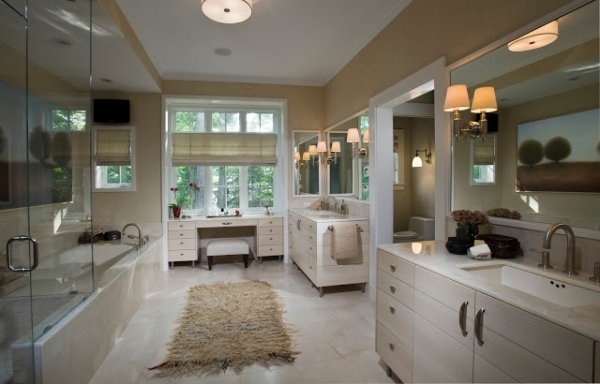 Browns and whites collaborate beautifully in this bathroom. We love the flower accents. The relationship between the hardwoods and the modern design is the highlight of this luminous bathroom. The wood balances and complements the bathroom design. Talk about glamour. 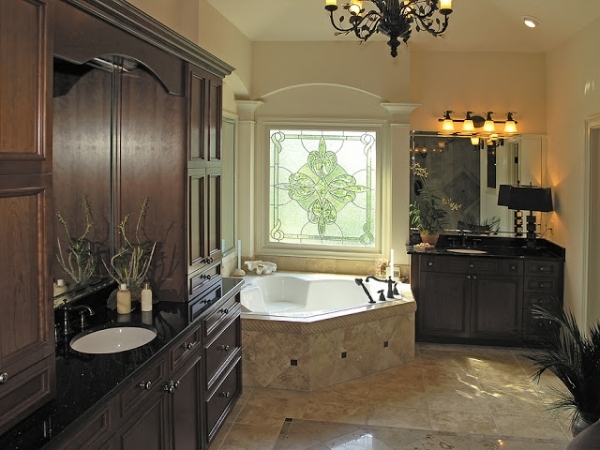 This gorgeous space has a luxurious canopy, intricate details, and a claw foot bathtub. We love the simple color palette in this room. A stained glass window, dark chocolate wood, and a chandelier, add luxury and enchantment to this space. Natural tones and stone walls surround you in this room, creating an earthy and comforting atmosphere. This contemporary bathroom is absolutely gorgeous. We adore the wooden bench, it is a unique and interesting touch. The white and brown wicker combination is fantastic in this sumptuous bathroom. The flowers lining the bathtub add a bit of color and fun. The storage in this bathroom is fantastically done. We also love the colors and the use of the white rocks. The openness of this space is positively amazing. The warm and spacious atmosphere is definitely a wonderful place to relax. Amazing bathrooms come in all shapes and sizes. We love looking at how others design their spaces, it gives us wonderful ideas. 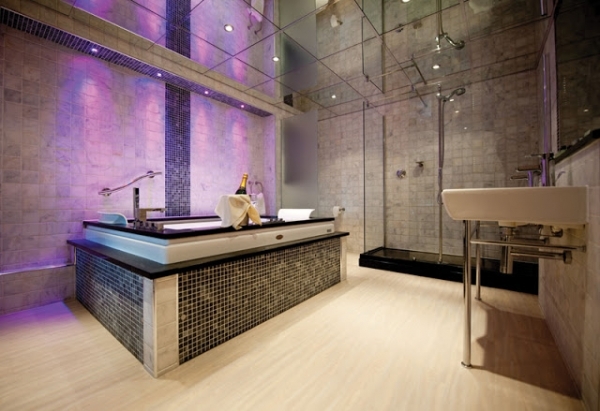 We hope these particular amazing bathrooms did the same for you.